For the third straight year, the Massachusetts clean energy economy is growing. The 2013 Massachusetts Clean Energy Industry Report shows clean energy jobs grew by 11.8% from 2012 to 2013, following 11.2% growth the year before and 6.7% growth in 2011. In just the past two years, clean energy sector jobs have grown by 24% overall. This success in growing clean energy jobs is defying national and global economic trends and puts Massachusetts squarely on the global map as a leading clean energy economy. Established in 2011, our Massachusetts Clean Energy Industry Report seeks to gauge the size and growth of clean energy sector employment and businesses across Massachusetts. This year’s report provides further evidence that this remarkable rate of growth hasn’t occurred by accident—it’s by design. The seeds were sown for sweeping clean energy economic development policies when Governor Deval Patrick signed the Green Jobs Act creating the Massachusetts Clean Energy Center (MassCEC) five years ago on August 13, 2008. At MassCEC, we are dedicated to growing the clean energy sector from the ground up. We do this by assisting early-stage companies with funding for research and by targeting investments at companies that aim to create jobs here in Massachusetts. We work with schools, non-profit groups and businesses to develop clean energy job training programs and we fund internships so the next generation of clean energy workers is prepared to step into the jobs of tomorrow. We offer rebates and incentives for renewable energy projects that help create the markets for Massachusetts-made technologies. And we are building the infrastructure to ensure Massachusetts’ clean energy leadership into the future. As a result of these efforts, there are now 79,994 Massachusetts clean energy workers and 5,557 clean energy firms operating in Massachusetts. And employers are “bullish” about continued growth in the year to come. Stemming from Massachusetts’ unparalleled access to financial and intellectual capital, some of the largest gains in employment came from early-stage clean energy innovation firms entering the market. Engineering and research jobs grew by 32.4%. Manufacturing and assembly jobs rose again this year as well, by an impressive 20.6%. And we’re seeing this growth across the state, with the southeastern region rebounding from a period of decline from 2011 and 2012 to become the fastest-growing region of the Commonwealth in terms of clean energy employment with a 14.3% increase from 2012 to 2013. Small, independent contractors were a major driver of growth in Central and Western Massachusetts. 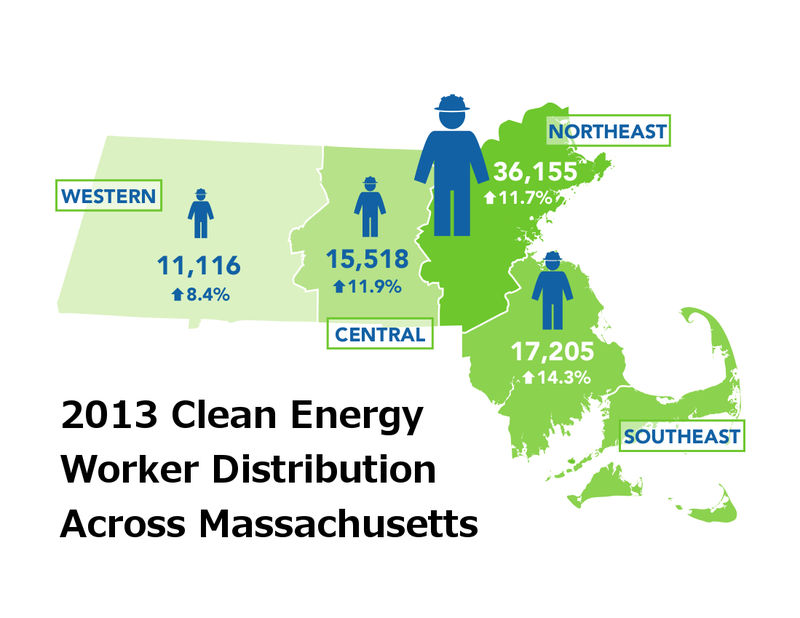 The Massachusetts clean energy workforce is also expected to grow more diverse. Women now make up approximately 21% and racial or ethnic minorities make up 14% of Massachusetts’ total clean energy workforce. For the first time, this year’s report provides a detailed report on the business climate for clean energy firms and reports a high level of business confidence. The employers surveyed provided detailed feedback that will help Massachusetts policymakers continue to implement policies that are tailored to meet the needs of this rapidly growing field. The 2013 Massachusetts Clean Energy Industry Report is clear evidence that Massachusetts’ nation-leading investments in clean energy are paying off. With its continued projected growth, the clean energy sector is poised to join the Commonwealth’s other marquee industries including life sciences, financial services and information technology in the years to come.